One again, I write about wonderful places where we all want to be... vacation! This time we went to Barcelona for a long weekend. Also, my dear mom, her husband (Mr. Arie Feldman) and his lovely daughter Avia can to breath cleaner, sharper and much more "sophisticated" European air. I will try to write as entertaining as possible and to provide as much useful information as possible. 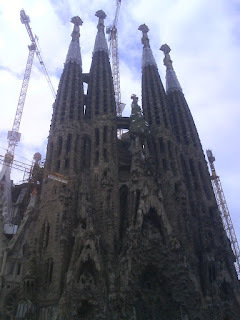 Next morning, we went to see "Gaudi's Places". First of all, we went to some church, and the city is full of them, then to museum of Picasso and finally to Gaudi's garden. The garden was amazing place, full of devices and creatures from Gaudi's crazy mind. Following that, we went to Plaza of Spain to watch a fountain show (http://picasaweb.google.com/john.markh/20070406Barcelona). The day after we all went to Sitges (http://picasaweb.google.com/john.markh/20070407Sitges), a lovely town just outside Barcelona. There was nothing really special in there, so we walk a bit around the town and had couple of beers while there. On a third day, we went to Monserrate. It is a monastery on top of a mountain one hour from Barcelona (http://picasaweb.google.com/john.markh/20070408Monserrate). Instead of going to "another" church, we decided to buy loaf of bread, pack of cheese and olives, and to climb to the highest peak of the mountain. After two hours of going up (1236 meters) we finally reached the top. What can I say... if god is somewhere it is probably there, high in the mountain. Now, if we are talking about food, let me give you a good recommendation. The place is called "Los Toreros". It is clean, the food is fresh and delicious, and it is cheap! They have amazing "Brava Potatos" and "Sangia" (chilled sweet red wine with oranges and lemons).The restaurant is not far from Plaza Catalonia (map). BTW: did you use the elevator or the stairs ? Hope you enjoined yours trip , see you soon. http://www.barcelona.com/barcelona_city_guide/where_to_eat_barcelona/ciutat_vella_restaurants/ovni). It is kind of healthy "fast food" restaurant. Barcelona is beautiful. Although I just go to the same places everytime I'm there. Hope you guys had a really wonderful time!